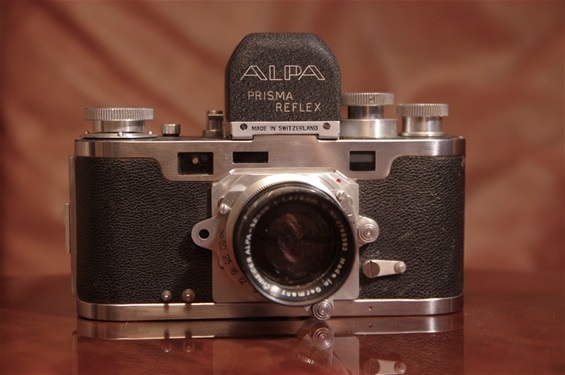 Alpa from Switzerland was among the very first to produce a pentaprism SLR, though not really eye level, when they launched their Prisma Reflex in 1949, after having established the company in the late 30s. 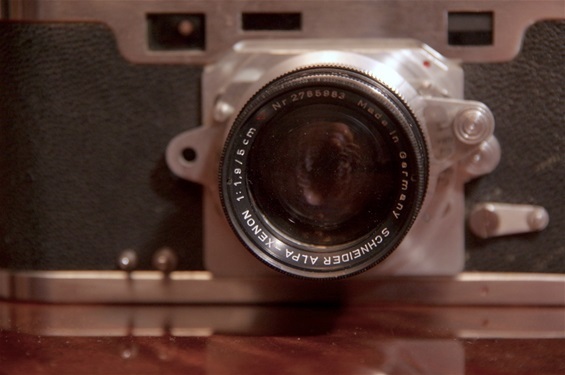 Their first cameras were waist level slrs from early '44. (Model 1). 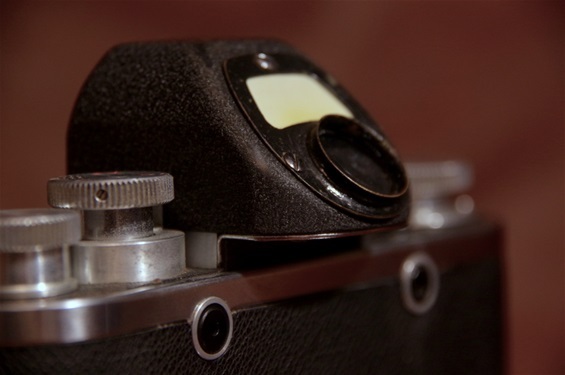 They made high quality cameras, but never sold in big quantities and struggled economically. Towards the end of the 70s they had to give up their own production of 135 mm film cameras, but produced some cheaper cameras with Chinon in Japan around 1980. They still earned the reputation of a high class producer of bigger format cameras until 1990, when they had to end production. In 1998, however, the brand name was reestablished by new owners, restarting the company as a hi class producer of medium format cameras. 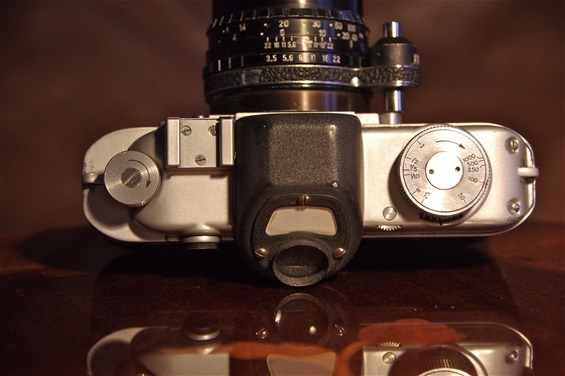 Alpa was one of four "Eye Level" SLR producers who started series production before the end of the 40s. For more about that, see The Origin chapter. Alpa Prisma Reflex, Mod. 3 of 1949. Based on the waist level Reflex model 1 of 1944. Surprisingly, this model is featuring an RRM, rapid return mirror. (See Some Definitions chapter.) Sn. is hidden inside the camera, on the back wall: 22477. Not a regular penta prism, but a variant called Kern prism, the difference being that image is showed in a 45 degree angel upwards. So, it is not waist level, but not quite eye level. 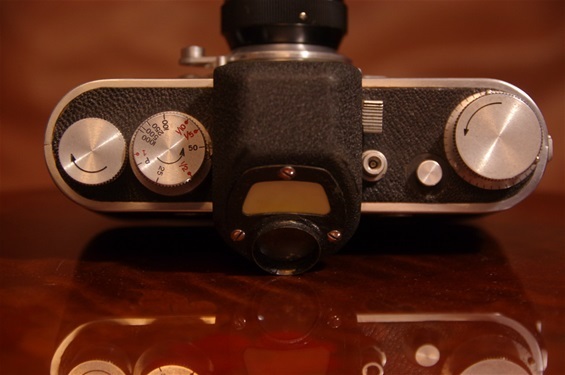 Later models, from 1959, featured an ordinary eye-level penta prism. A Schneider Alpa Xenon lens. Technically identical to the Xenon lens made for Rectaflex, but with 1,9 as biggest opening. Sn. 2785983. The controls: A big winder knob to the right, with frame counter underneath. A rewind release button and a small shutter release button close to the prism house. In front of this, a handle to lift the mirror. To the left, a shutter time knob with all shutter times, fast and slow. No extra mech for slow times. The winder has to be twisted first, then press the button down and turn. Outer left is the rewind knob. Except for the penta prism, this camera house is almost identical to the waist level Reflex. 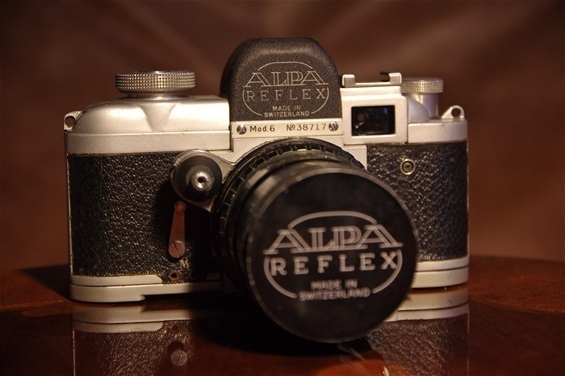 From the Model 4, the name Alpa Reflex was back, without "Prisma". The model shown here, model 6, is a later one with a rounded top in aluminium and redesigned viewers. It also features the PAD system, pressure activated diaphragm, giving a semi-automatic diaphragm. This model weighs 637 grams. Size: 145x90x40+15 (for the overhanging viewer.) Sn. 38717. Alpa mainly got their lenses from other suppliers. 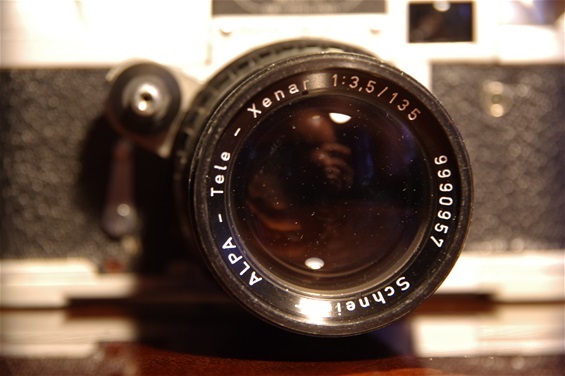 here a Schneider produced Alpa-Tele-Xenar 135/3,5. Sn. 9990957. Compared to the Prisma Reflex: only the prism house remains. A big winder/shutter time dial to the right. Then the Kern Prism viewer, a flash socket (cold shoe) and the smaller rewind knob.